I don’t have to tell you that swimming is a wonderful sport with countless benefits, but many people unfortunately struggle to realize their full swimming skill potential sufficiently to enjoy those benefits. It might sometimes seem there is an impenetrable wall which a swimmer cannot get through to reach the next level. This can also be referred to in sports terminology as a plateau. Reaching a plateau means either that your times are not getting any faster, or swimming just does not seem to get any easier, or that you just cannot seem to learn a particular skill. This can be very frustrating and can often also lead to abandoning a sport which is, of course, quite sad. No matter what swimming level you are at, reaching a plateau at some point in your training or learning is a reality and will happen. What if I were to tell you though that there is a secret passage way through every plateau to get to the next undiscovered world? Just as in Jules Verne’s famous novel A Journey to the Center of the Earth, one just needs to find the right passage and new amazing world full of mind boggling discoveries awaits on the other side. Ok, that is enough of the philosophical mumbo jumbo. What I really wanted to talk to you about today is mindful body awareness control in the water. If you feel like you have reached your plateau, perhaps gaining total body awareness could be just the hint you need to get to the next learning stage. Do you know what happens to your legs during a breath? Have you ever paid attention to what your hands do when you push off the wall? Knowing the answer to these, and many other body awareness questions, is what separates successful swimmers from the mindless individuals who just go up and down the pool without even giving a thought to their stroke. Fair enough, if someone does not want to learn to swim properly, mindless swimming is a way to get away from the real world and relax, but mindless swimming with a proper technique would definitely give them much more pleasure, relaxation and most of all prevent swimming related injuries. 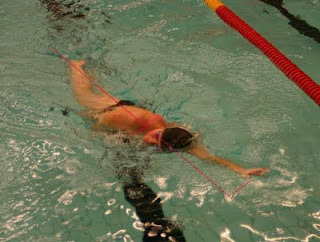 Total and controlled body awareness is a key to a successful and enjoyable swimming experience. Learning to swim or improving on your swimming skills can be at times an overwhelming task as there are million and one things a swimmer should think about: a proper head position, above the water high elbow recovery, hip rotation, front high elbow catch, a nice narrow kick during Freestyle, and proper breathing rhythm. Putting all of these body movements together and controlling them in a proper way is a magical thing which comes with a lot of practice, but if a beginner swimmer tries to think about all of the above aspects of swimming at once, it is usually a disaster and it always looks awful. Do not let that discourage you though :). To help us with this, we break the stroke down into miscellaneous swimming drills instead of swimming the full stroke all at once. If you read this blog regularly, you have heard me mention many swimming drills which are specifically designed to work on one of the million and one things that you should think about. This drill isolation technique is the only way to learn the proper swimming body movements and then imprint them onto your muscle memory. It is exactly the same with reading. If, when you were five years old, I put in front of you the Jules Verne adventure book I mentioned earlier, you might look at me in dismay and feel overwhelmed. However, if I first teach you the alphabet and then build gradually on those skills, by the time you are ten years old, you will reach for the book on your own initiative and will devour the German professor's adventures within several days. I’ll not discuss any particular swimming technique drills here today, but I’ll point out and isolate a couple of unconscious movements that you are, more than likely, guilty of. I’ll focus mainly on freestyle as that is the most common stroke, but the same thought process applies to everything you do in the water. One of the toughest things to learn for a swimmer is to separate and control different parts of the body. For example, when a swimmer takes a breath during freestyle, it usually means their entire body rotates at the same time with the head similar to a big, stiff piece of styrofoam float. 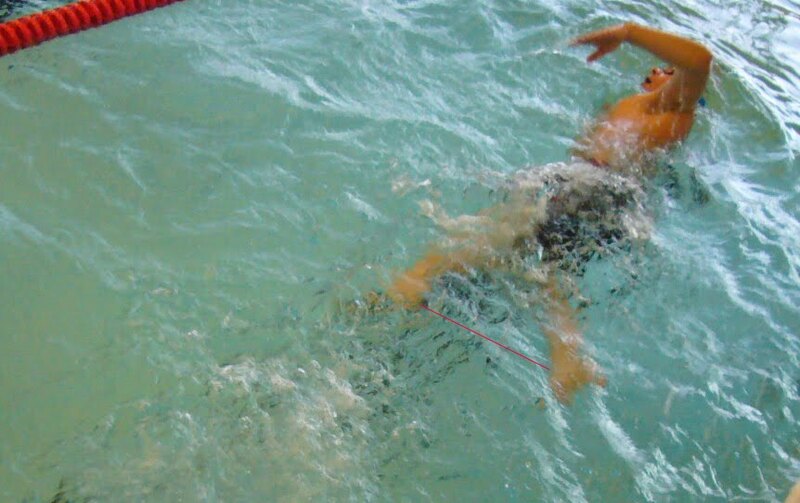 Unfortunately, this is not the right way to swim freestyle and it causes many problems. If your body is stiff and it rotates as a whole at the same time as your head, your front arm will more than likely shift from being straight and pointing forward to being driven to the side (in other words, crossing over the imaginary line in the middle of your body or going too far away from it). This causes your body to move in a snake-like (zig zag) direction instead of forward. So, lesson number one, relax your body and make sure when you take a breath to the side you do not take your body and arm with it. The proper way to do this is to rotate your hips and then, slightly after that move, your head separately to breathe by rotating your neck when you are on your side. Also, loosen the shoulder joint of the arm that is extended forward and keep the arm stretched out to the front. As you can see, a simple breath requires the coordination of a loose lower shoulder joint, hip rotation and neck rotation - all separate, controlled movements which have to happen almost at the same time. Hence you need total awareness of your body movements while swimming. Another big issue is spreading ones legs too far apart during one kick cycle. Again, you will usually notice this flaw usually during breathing. A swimmer with this problem will appear to have a normal narrow kick but, during the breathing stage of the stroke, he/she will spread the legs apart in a horizontal direction, like a slow motion scissor kick. So the pattern of the kick could be something like kick, kick, kick, kick, kiiiiiiiiick, kick, kick, kick, kick, kiiiiiiick etc. The reason this wide kick happens is the fact that the swimmer uses the big slow kick for balancing support during the breath. Next time you are in the pool with fellow lap swimmers, watch underwater from behind and see if you can spot this irregularity in the kick. Then try to become aware of it during your own swimming. I guarantee that you have it in one size of the kick or another. To fix this scissor kick problem, you should re-read the paragraph above with regard to loosening your shoulder joints:). The loss of balance feeling which causes the scissor kick is usually caused by the cross over of the lower arm during the breath, so by being in control of your separate body part movements and not crossing over you will eliminate the scissor kick flaw. You can also kick to a beat in your head and if you skip a beat, then you know you have the scissor kick syndrome :). Or just rub your toes against each other with each kick and if there is a period without a toe touch, you know you got it bad.:). There are many more of these small nuances that are done on an unconscious level and, unless a fellow swimmer or a coach points them out, the swimmer in question will never notice them. So remember, next time you are out there doing your thing, practice total body awareness and try to notice what each separate part of your body is doing. Pick one part of your body and follow its movements in your mind through one lap and see if you can visualize exactly what it does. Once you discover an issue, find a drill (not a full stroke) which helps to fix it.